There’s something perfect about the opening scene in Jemaine Clement and Taika Waititi’s excellent new comedy, What We Do in the Shadows, which documents a few months in the eternal lives of a gang of vampiric flatmates living in modern day Wellington, New Zealand. Viago (Waititi, who also co-wrote the film with Clement), the dandy, sensitive 379 year-old of the bunch, awakens and rises stiffly to a sitting position in his coffin. As he’s exiting the creaky box to begin his night, he becomes awkwardly stuck in a diagonal position, and grins sheepishly at the camera. Then he leaves the dreary room to gently wake his flatmates. It’s one of countless gags in the film that manages to incorporate an element of the time-honored vampire folklore that we are all at least nominally aware of while at the same time finding a silly and charming way to laugh at it, often reducing it to deadpan irony and slapstick. The coffin gag seems to encompass the very state of the faux documentary genre (and the service that this film does for it), which has felt stagnant ever since The Office spawned its countless inferior imitations, since Spinal Tap and the great ’96-’06 run of Christopher Guest films spawned their countless inferior imitations, and since the atomic bomb of Reality TV numbed us all to the this-is-really-happening aesthetic. There’s no reinvention here—the film follows the same genre tropes we’re probably all at this point overly familiar with: the lo-fi hand-held camera work; the revealing (and sometimes confessional) interviews; the shambling real-time unfolding of the narrative; the awkward conflicts between subjects; the History Channel-esque visual footnotes (drawings, painting, photos) that depict the characters’ personal details. And yet somehow each sequence seems to build upon the hilarity of the one that preceded it while remaining completely free of any tired “this joke again?” repetition. Really, it’s just so fun to laugh with this crew, and maybe that’s what makes this film such an achievement. The theme of friendship is as abundant throughout the film as its many over-the-top fountains of blood, and it feels like the documentary crew—and thereby the audience—is, rather than being implicated in any way, along for the grisly ride (though we are told by way of introductory title card that the crew are in fact wearing crucifixes during filming). 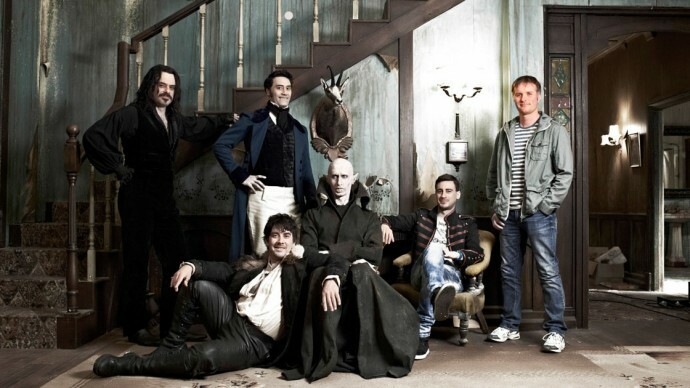 Viago’s flatmates are a varied crew: Deacon (Jonathan Brugh), being only 183, is the messy, hard-headed bad boy of the group; creepy, silent Petyr is 8000 years old, dwells behind a stone slab in the basement, and is of the toothy, terrifying Nosferatu strain; and Vladislav (Clement) is your sort of sexualized, Transylvanian dark artist—he used to be a master shape shifter but lost his powers to his arch-enemy, “The Beast,” whom we meet at an Unholy Masquerade Ball populated by werewolves (whose alpha male is played by Flight of the Conchords’ Rhys Darby), zombies, and other incarnations of the undead. Beyond this, there’s newly minted vampire Nick (Cori Gonzalez-Macuer), whose clumsy, reckless adjustment period drives Deacon up the wall (literally). There’s the disturbingly motivated human Jackie (Jackie van Beek), Deacon’s familiar, who doggedly does his bidding because he’s promised her eternal life. There’s a pair of cops played by Karen O’Leary and Mike Minogue who show up to investigate a noise disturbance but, because Viago has gingerly hypnotized them, are only able to notice minor infractions (“not a smoke detector in sight”). And then there’s computer analyst Stu, Nick’s best mate, played by actual computer analyst and enjoyably unassuming non-professional actor Stuart Rutherford, who, even more so than the camera crew, is a bridge for the audience into the fearsome fraternity. The vampires treat Nick as a friendly equal, are even cordial toward him, and though the film’s sinister subjects might recall certain landmarks of the genre—1992’s Man Bites Dog and 1999’s The Blair Witch Project come to mind, films that literally and thrillingly make the camera crew their final victims—Stu never seems threatened or unwelcome. The polite, inclusive attitude of the vampires toward Stu and the camera crew is Shadows’ biggest charm, and its often hilariously realized during the interviews as they gamely explain this or that aspect of their tortured existence (I’ll never stop laughing at Vladislav’s attempt to describe why vampires prefer the blood of virgins). The vampires, each clad in their respective generations’s raggedy European garb, spend much of their screen time fussing over unwashed bloody dishes, lamely toying with their dinner guests before eating them (Vladislav admits to being inspired by the maggot scene in The Lost Boys), and wearily getting through some of the more mundane aspects of vampirism: since they cannot enter a room without being invited inside, they are often turned away from the trendier nightclubs and usually end up at the same old dull neighborhood bar (sound familiar? ); they can’t see themselves in mirrors so they must rely on one another’s ridiculous drawings of each other for fashion advice; during one scene Viago carefully spreads newspaper beneath a couch and fashions a bib into his collar while his oblivious human date talks about her future plans in life, only to have his good intentions thwarted by an unexpected geyser of blood that sprays all over the living room after he finally bites her; Nick projectile vomits blood after trying to eat his favorite food, chips. “Don’t believe the hype,” he tells the camera crew, already sick of eternal life after only a few weeks. Clement and Waititi collaborated throughout the Conchords series and on Waititi’s previous effort, Eagle vs. Shark. If you simply observe the musical numbers in Conchords, it becomes clear that they know their genre conventions and how to exploit them in the name of comedy. The soft touch and light-hearted charm they’ve developed together works wonders for Shadows and seems to arm them with some kind of warmth rather than cloak them in misery and darkness. Though initially disgusted with Nick’s ham-handed transition into the vampire lifestyle, Deacon eventually befriends him and tries talking to him, heart-to-heart, after Nick experiences a loss; rather than mourn eternally for a long-lost lover, Viago makes the effort to reconnect with her; instead of a bloody show-down between the vampires and the bro-like tribe of werewolves, we see the lycanthropic rivals welcomed into the apartment shortly after attacking and converting Stu (as well as mauling a camera guy). There’s a lot to love here. The filmmakers’ understanding of the subject matter and of the container it’s being delivered in triumphantly revives a damn near comatose genre of storytelling. By embracing the lovable, understated tenderness that endeared Flight of the Conchords to so many people and gifting it to the blood-thirsty troupe in Shadows, Clement and Waititi hilariously, almost movingly make the inhuman human again, and lucky for us, we’re invited inside—and kept off the menu.